The Physics Department only admits the number of students that we anticipate being able to support all the way through the PhD. Every effort is made to offer continuous financial support during the entire PhD program. This financial support typically comes in the form of Teaching Assistantships, Research Assistantships, and Fellowships. Teaching Assistantships (TA’s): Newly admitted students are typically offered TA’s for their 1st year in the program. TA’s are 12-month appointments that provide funding throughout the academic year and the summer after the 1st year. In addition, 2nd year grad students usually work as TA’s. TA’s typically work as supervisors in freshman physics labs, as recitation leaders, and as graders for undergraduate courses. The TA workload is roughly 20 hours per week. All TA’s receive a stipend, full tuition waivers, and University health insurance coverage. The current Physics Department TA stipend is $26K per year. 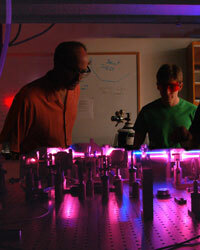 Research Assistantships (RA’s): Students typically move from TA’s to RA’s during the 2nd or 3rd year of the program. RA’s are usually funded through grants held by the student’s PhD advisor. RA’s are also 12-month appointments, and include a stipend, full tuition wavier, and University health insurance. Current RA stipend levels are typically in the range of $27K – $30K per year. Fellowships: Graduate students can also be supported by externally funded Fellowships. For example, in recent years, we have had students supported by NSF Fellowships, NASA Fellowships, Meyerhoff Scholars, and GAANN Fellowships. Additional information about external fellowships can be found here.